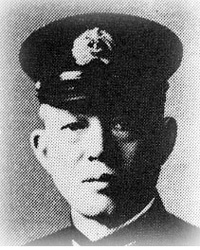 Marquis Daigo Tadashige commanded Submarine Squadron 5 at the start of the Pacific War. He was later promoted to vice admiral and command of Eastern Attack Group which carried out midget submarine and merchant shipping attacks on the east coast of Australia. He was given command of 6 Fleet in May 1945 and served in this post to the end of the war. Daigo was held responsible for a massacre at Pontianac and executed by the Dutch in 1947.